Few films have had the budget and the build-up that John Carter had. We've had months and months of publicity for a movie based on an eleven-volume series of books written close to a century ago that I figure few people have actually read. This is all extremely curious to me because this kind of push is reserved for summer blockbusters, not a big-budget film released early in the year. Now there's a push to make John Carter into a fiasco, a monumental flop, a disaster both financially and artistically. John Carter may fail financially, and it has problems, but it is not a horrible film in the style of Waterworld or Green Lantern. John Carter (Taylor Kitsch) is a Confederate veteran mining for gold in Arizona. While escaping forced conscription to the Union Army by Colonel Powell (Bryan Cranston), he finds himself in a cave of gold. However, there he encounters a mysterious figure, and John Carter is transported to a mysterious world. In this strange world, he is able to leap over great heights and distances. He is taken by strange green-skinned four armed creatures called Tharks. Carter is given the power to understand the languages thanks to Sola (voice of Samantha Morton), and soon he becomes embroiled in the war on the planet the natives call Barsoom, but which he finds to be Mars. He soon rescues the Princess Dejah Thoris (Lilly Collins), a brilliant scientist who is running from a forced marriage by her father Tardos Mors (Ciaran Hands), the Jeddak or 'Leader' of the city of Helium, to Sab Than (Dominic West), who has been laying waste to the planet in an effort to conquer Barsoom. Sab is being helped by Matai Shang (Mark Strong), head of "immortal" beings who want him to rule the planet. Carter and Dejah fall in love and he, with Sola, will defeat Sab and Matai with a little help by Dejah's captain Kantos Kan (James Purefoy). At an epic battle Carter defeats Sab and Matai, but Matai spirits Carter back to Earth, and Carter attempts to return. All this is told through the framing story of John Carter's nephew, one Edgar Rice Burroughs (Daryl Sabara), reading Carter's journals. As lengthy as that summation of John Carter may have been, it's actually more concise than the movie itself, where we have the first of its problems: a rather lengthy story where exposition and character are rushed to try to get as much of Burroughs' A Princess of Mars as possible onto the screen. The story is so vast, with so many characters, some which sadly look so much alike one forgets who is who, that soon the story becomes too much to fit into one film even at its expansive two hour twelve minute running time. Director Andrew Stanton (who co-wrote the script with Mark Andrews and The Amazing Adventures of Kavalier and Klay novelist Michael Chambon) thought John Carter would be the first part of a trilogy. My question to Stanton is, given that so much happened in John Carter, what on Earth (or Barsoom) would you give him to do in a potential Parts II and III? So much happens in John Carter that story-wise, we are forced to take leaps as large as those Carter can take on the planet. If the massive nature of the screenplay isn't already far too much to fit into just one film (I'd argue that Stanton could have made at least two films out of John Carter), we get two other problems. The first is the framing story of Burroughs reading the story at the very beginning (thus giving away the 'twist' that Carter would somehow have to end up back on Earth before the film ended) and occasional flashbacks to Carter's pre-Civil War life that only serve to take us out of the first story (Barsoom/Mars) as well as make the film longer. Stanton did a brilliant job with Finding Nemo, but I question whether he was the right choice to make his live-action debut on something as massive as John Carter. John Carter brings to mind the Elizabeth Taylor version of Cleopatra, and I suspect that future film historians/buffs will make comparisons between them. That film was the most expensive film at the time, nearly bankrupting 20th Century-Fox and becoming symbolic of a runaway production. Its director/screenwriter, Joseph Mankiewicz, was an experienced writer/director and he couldn't control or save Cleopatra from going out of control. It amazes me, therefore, that executives would trust something as large as John Carter to someone who had never directed people outside a recording studio. Even if he had the brilliance of a Mankiewicz, Stanton could not get real performances out of the live-action performers. I have never seen Kitsch on-screen apart from X-Men Origins: Wolverine, so I cannot vouch as to how good or bad he is as an actor. I cannot say whether his voice is that low and growly or whether this was a decision for the character. I will give him the benefit of the doubt because the character was so thinly written, despite the bungled efforts at a backstory. As a digression, while watching John Carter I kept wondering how, despite wearing a minimum of clothing and having very light skin, how was it that John Carter did not burn or even get a tan while crossing the deserts of Barsoom? Just a thought. Most everyone else wasn't directed so much as given sometimes clunky dialogue and asked to say it. Hands is a competent actor, but here he looked stunned, as if surprised to have ended up in this film. Purefoy and West look so much alike one soon just gave up trying to distinguish between the two. Moreover, the immortal priests (led by Strong) were shape-shifters, so one never could trust whether they were looking at the actual actor or this priest whose motivations were unclear. Why did he want the bad guy to win? It was something about managing destruction, but since we never got to know the characters, their motivations were opaque. In truth, John Carter was opaque in terms of how it looked. I saw the trailer, and there was a lot of light in it, so perhaps it was just a bad print or because I was sitting high up in the theater, but Dan Mindel's cinematography was drenched in a lot of darkness to where things were at times hard to distinguish. However, I digressed. I think Collins did a good job of being a princess warrior (or warrior princess, take your choice), though at times she looked as if she were trying too hard to make the story work. Even she could not make the dialogue make sense. It really was clunky dialogue. "You killed him with one blow", the Tharks say to John Carter in astonishment. I know it's Disney, but why did The Brave Little Tailor come to mind? Take another example with regards to the city of Helium. Is it me, or does the line, "If Helium falls, so does Barsoom" just sound idiotic? I was the only one laughing out loud when Collins said that, and even worse, the line was said twice (Kitsch's delivery didn't make it any less hilarious). It's astonishing that Stanton and especially Chabon (a Pulitzer Prize winner no less) didn't read that and think, 'maybe we should change the name of the city' especially when I heard such things as "Helium is lost" or "Will you stay and fight for Helium?". It's even more astonishing that no one would have thought they were packing in a great deal into John Carter. It's so expansive, so grand, that the story somehow becomes lost. It isn't hard to follow so much as it becomes too much too follow especially since this is a hoped-for trilogy. Stanton was not the best choice to direct John Carter. The actors came off as stiff, even confused, the story equally so. To make matters worse, certain images and scenes appear to echo ones from other films. When the Princess first speaks directly into the camera, I wrote "...and she's the Princess from Dune". When John Carter is forced to fight in an arena, I wrote, "Now to Geonosis" because it looked so much like the arena match in Attack of the Clones. Again and again, we come across these moments that appear taken from other films, and given that this is an original source, it makes matters worse. Finally, some of Michael Giacchino's music was wrong. When John Carter discovers he can fly, a scene that made the audience laugh, the music is far too romantic for the scene. 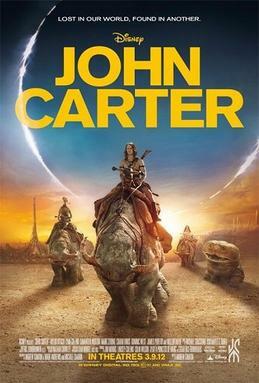 Given all that, John Carter is not a disaster. At times, it can be entertaining. I'll say this much: every penny that was spent is up on the screen, but I wish some of that cash had been put to rewriting the script to make it more cohesive and to open up for a real sequel. It's odd but when I left John Carter, I thought the movie was over with not much opening for a sequel. There can be, but as far as I was concerned, the end of John Carter was the end of John Carter. For myself, I didn't see John Carter as being a terrible movie. Disorganized: yes. At times silly: yes. However, I was entertained, I had a generally good time, so I can't fault it for not living up to the bizarre marketing. If you want something to take your mind off things for two hours, that gives you some good fight scenes and a beautiful princess, John Carter will do. It can be enjoyed, only if you don't ask too much of it...unless you really want Helium to fall.